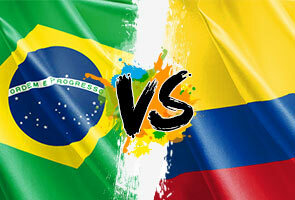 Colombia are set to clash with hosts Brazil, a rival they have only beaten twice in 25 meetings. RIO DE JANEIR: The World Cup resumes after a 48-hour lull in hostilities on Friday with two blockbuster quarter-finals, as France take on old rivals Germany and hosts Brazil clash with Colombia. France and Germany get the last eight ball rolling at 1600 GMT at Rio de Janeiro's Maracana stadium. Then up the coast in Fortaleza, Brazil's talismanic poster boy Neymar comes up against Colombia's James Rodriguez, the Monaco playmaker who tops the World Cup scoring chart with five goals. Germany coach Joachim Loew sprang some selectorial surprises, reshuffling his defence by dropping Per Mertesacker and bringing back veteran striker Miroslav Gotze. With Karim Benzema in top form, France are dreaming of their first World Cup title since their 1998 triumph on home soil. "There is no apprehension or fear. There is no reason for us to feel any," said manager Didier Deschamps, the 1998 World Cup winning captain. Friday's match gives France the chance to avenge semi-final defeats to Germany in 1982 and 1986. The '82 semi-final in Seville produced one of the most controversial World Cup clashes when German goalkeeper Harald Schumacher flattened Patrick Battiston leaving the Frenchman with cracked ribs, two missing teeth and cracked vertebrae. The winner of Friday's first quarter-final will play either Brazil or Colombia in the semi-finals. Brazil's build-up has been dominated by 'cry baby' headlines over the cascade of tears from the players at the nervy last 16 penalty defeat of Chile last Saturday.